SuperSync can connect to another computer running SuperSync if that computer has the SuperSync Server enabled. select the Connect To Server command from the SuperSync Remote menu. 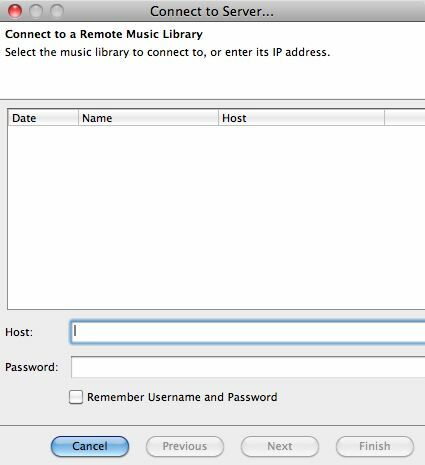 use the Configure Remote Library command (in SuperSync's REMOTE Menu) and then select the Connect to another networked SuperSync server option. This will open the Connect to Server window that configures the connection to a SuperSync Server. To connect to a networked SuperSync server, you need the host name/IP address/domain name, port number, and password (if the Server has a password set). Enter the host name/IP address/domain name in the Host field and, if needed, the server's password in the Password field. Click Next to proceed. Tech Note: If the server is not running on port 5360, the SuperSync default, enter the IP address, a colon, then the port number, such as: 192.168.0.100:5000. In most cases, you will not need to change the SuperSync Server's port but some network administrators and users may want change this for various reasons. Enable/Check the Remember Username and Password checkbox to connect to this SuperSync Server without having to continuously enter your password information. Tip: Your password data will be saved in a text file in SuperSync's Settings Directory. While the passwords are encoded for protection they can be decoded with some effort. For this reason, we do not recommend you use commonly used passwords for your SuperSync Server passwords. When you have entered the SuperSync Server's info, click the Next button and follow the on-screen instructions to connect to this Remote Library. Note, this window shows all the SuperSync Servers you have connected to so that you can quickly select and connect to a server. Tip: You can connect to a SuperSync Server running on your local network (aka LAN) in one step by selecting that computer in the Connect to LAN server submenu in SuperSync's Remote menu. Tip: Use the "Check my IP address..." command under the Tools menu to get your computer's IP address. You can then use this address to connect from another SuperSync computer. Once you have connected this library, its contents will appear side-by-side with your Local Library in the SuperSync Window. You can now proceed to the Syncing Your Libraries section in this manual.